When I peeled off the protective plastic, some adhesive was left behind, spoiling the display's appearance. Is this a common problem? Is there some technique for removing the plastic so that all the adhesive goes with it? Fooey! Sorry to hear that. The plastic should come off without problem or leave residue. Goo-gone may help but I suspect it will remove some of the black surrounding material as well. If it's really bad please contact customer support for a replacement. 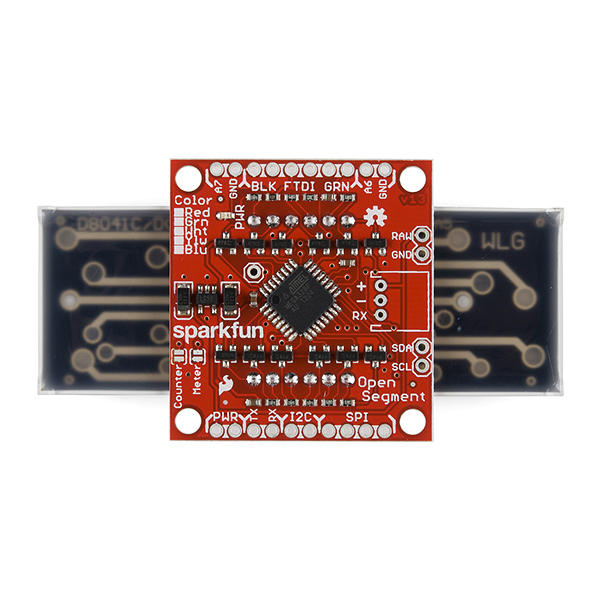 I am wanting to use two of these on an I2C bus. Is there any simple method to change the address of the device so that I can? There is a command to change the I2C address of OpenSegment. I just added an example to demonstrate how to do this. You can find all our examples here. The example to change the I2C address is here. Hope this helps! Providing OpenSegment with 5V from the 5V pin on the Arduino works great and is just as bright as if you powered it from an external 5 to 7V source. Sorry you ran into problems! If you think your OpenSegment might have gotten into a weird baud rate there is a way to reset to factory defaults (9600bps). The tutorial is here. I hope you find a way to get your Pixaxe to talk to OpenSegment. Can this be used outdoors without the display fading due to the sun? I have four of these displays. I plan on upgrading the software to measure the scale speed of a model train, using the "inc/dec" pins of the current board as start/stop inputs from a digital IR Detector. I plan on just adding another Mode to the current software, and a few extra Commands. I plan on making the software changes generic enough that it can measure any speed, at any scale (maybe with a few limitations), to 0.1 MPH or 0.1 KPH. The major problem I would have is that the current board does not have a 8MHz crystal on it, so the timing would be to the Factory Default of 10 percent error. I have the crystals and capacitors on order, so I can tack them onto the back of the board, and change the Boot File, to get the accuracy I need. 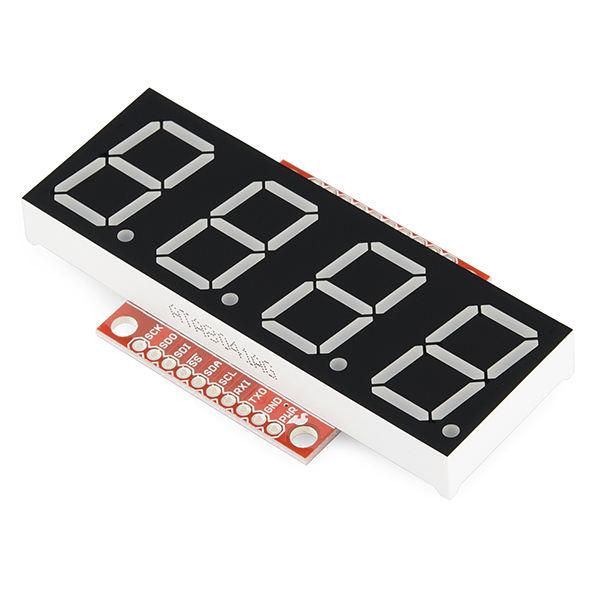 Currently, the board is used for display, counting and voltage measurement. None of these require the higher clock accuracy. But are there any plans to replace the Mode Pads on the board with a crystal and capacitors to do higher accuracy timing also? I would definitely purchase a board that was modified that way. Alternatively, would it be possible on the next Board Revision that you could lay out the traces so there will be through-holes for a crystal and capacitors? That latter may be easier, since there are already through-holes for the traces to the Mode Pads that could be used for the crystal and capacitor holes. I have unsuccessfully searched for a closed housing to properly mount this display in a panel in an industrial environment. Does anybody know where I can get such a housing ? Interesting question. Most of the sealed solutions I've seen have a cutout in the enclosure for display and a membrane switch with a clear window (I did some bad googling and found this example) and a strong adhesive backing. This very effectively seals the enclosure. 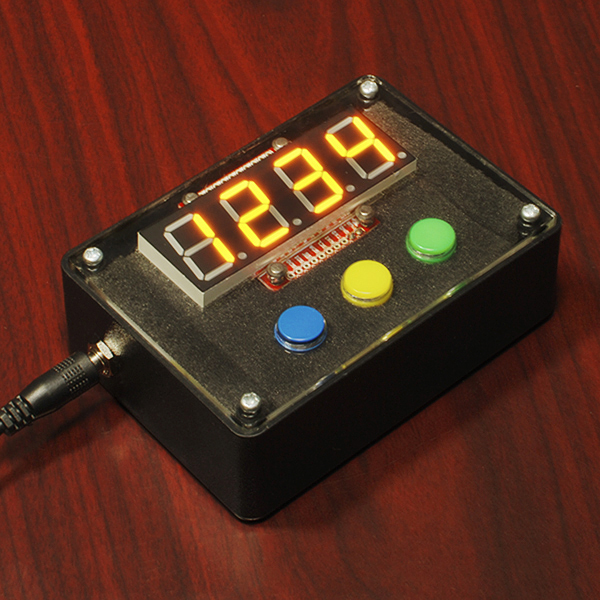 I've also seen 'smoked' or tinted plastic used to seal apertures and increase the contrast of a 7-segment display (just like a classic digital alarm clock). Shoot! Thanks for pointing that out. Looks like we shuffled our repo around a bit. We'll update those links. And code examples for a PicAxe, preferably smaller like 08M? Unfortunately I'm not enough of a PicAxe expert to write them. If anyone else does (or if you do!) please let us know and we'll roll the examples into the github repo + docs and give lots of thanks to the authors! Sorry you ran into troubles! We had an firmware bug with the first batch of displays that failed to check the solder jumpers. Looks like you fixed it yourself. Thank you. If you have any more issues please don't hesitate to say hello. I have been completely unable to upload code to either of two copies of this unit. When I use the FTDI basic breakout, the reset occurs, and avrdude initially seems to communicate successfully with the boot loader. But then it tries to send one byte, fails to receive any response, and gives up. This is the avrdude output. I have also tried flashing the latest optiboot using an stk500 compatible ISP programmer (Pololu AVR Programmer), but that doesn't seem to work either. The programmer doesn't seem to be able to communicate with the 328p after reset. In short, nothing I do seems to be able to change the behavior of the display's MCU. It still boots the original firmware. Has anyone successfully programmed one of these units once assembled? Also, should it be possible to program via ISP, considering how the AVR is connected? OK, I was able to reprogram it (to unresponsiveness) using the ISP programmer, and then recover it by uploading the contents from my other OpenSegment copy. I still can't get it to accept an arduino-style upload via serial though. Got it accepting programs via the FTDI. It appears to have similar to this issue, where a 500ms timeout in the bootloader is too short for the FTDI/avrdude combination. I raised the timeout to 1S, and also changed the baud rate to 57600. I had to burn that bootloader using an avrisp, but now I can upload sketches. Is there an available pin on this that could be used to count the high frequency pulses from this light sensor? I'd like to make the brightness of the display self-adjusting. I've done this to some extent with the older 7 segment Sparkfun displays. Note that I disabled saving of the brightness level to avoid wearing out the EEPROM! But I was reading and processing the light levels externally and using the display's command language to adjust the brightness. It worked, but it was slow and cumbersome. And the analog light sensors I've tried don't have much dynamic range for normal indoor light levels. I'm hoping the pulse-emitting sensor could have more detail at low light levels. Is there a pin on the OpenSegment that could be used to count such high frequencies? Really interesting question. Unfortunately there's almost no GPIOs left. You might be able to hook into the TX pin on the board (other than during bootloading, OpenSegment currently doesn't transmit anything out) and write an 'on-change' interrupt to capture the incoming pulses. You'd really only need to count the milliseconds between two pulses every few seconds and adjust the brightness of the display accordingly. You'd probably only need to check the pulse train coming from the TSL235R light sensor once a second. Changing the brightness more often than a second might look a bit odd. I assume these are the same displays as your 1" 7-Segments that are actually 0.8" tall? And why did you use the 328P over the 32u4? I would have preferred if you used different firmwares instead of solder jumpers for the different modes, and breaking out more pins would have been awesome. But really, those are just small things. Thank you for listening to our feedback and making these, they look great! Yep, these are the same 1" displays that are actually 0.8" digits. We (and I think most others?) 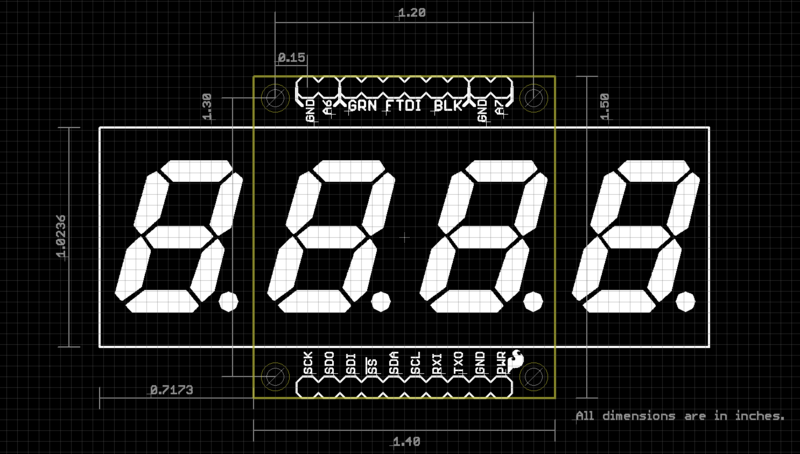 categorize a 7-segment display by its outside dimensions. The ATmega32u4 is good if you want to remove the FTDI from an Arduino. Because this product is not meant to be a full blown Arduino (we don't expect anyone to reprogram the board) the built in USB functionality of the 32u4 is not needed (and is just extra cost). Having a product with a microUSB on it is interesting, but we try to design stuff for the 90% user and I think 90% of users just need a serial 7-segment display, not a field boot-loadable Arduino with a 7-segment display attached. 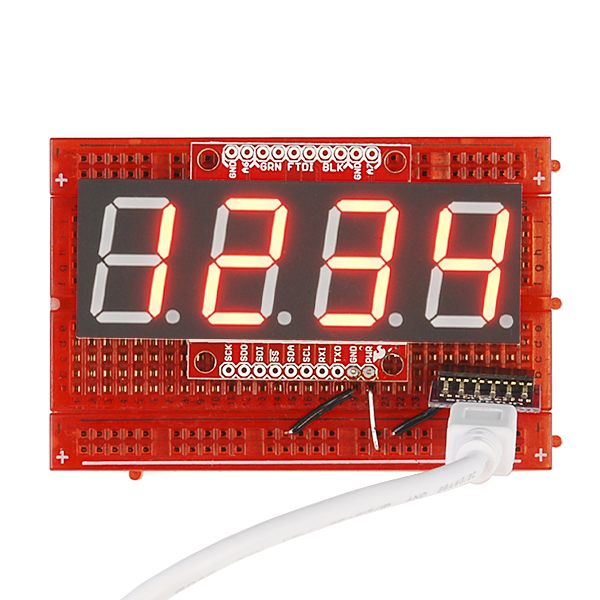 You can access the different modes using the solder jumpers or different serial commands. Offering different products with different firmwares is definitely a way we could go in the future. I assumed folks would want the flexibility but let me know if I'm wrong. More pins: but... but... there's not any left! :) Check the schematic. I had the shoe-horn the solder jumpers onto the xtal pins. Mouser (a significant other) categorizes LED digit displays by the actual digit height. The product titles in the datasheets for displays made by Luminex, Kingbright, Lite-On, Avago, etc. also go by the digit height, not the case size. 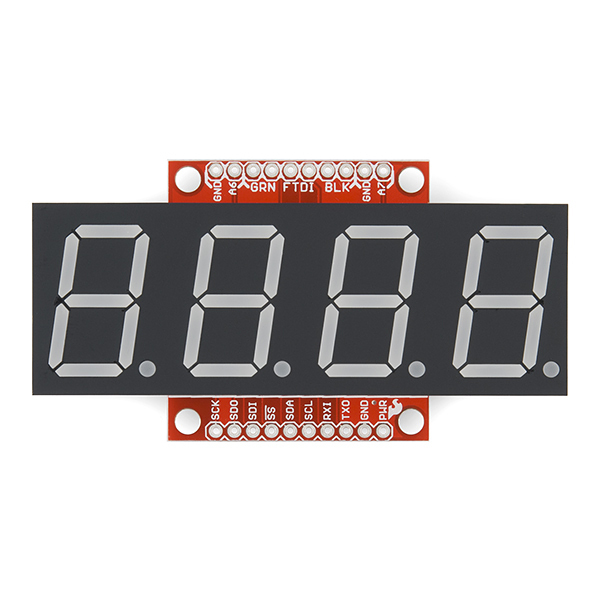 Perhaps you are thinking of dot matrix LED type displays, which are categorized by their case size. I stand completely corrected. You are right, the products are usually called out by digit height not overall height. We've changed the product titles from 0.1" to 20mm. 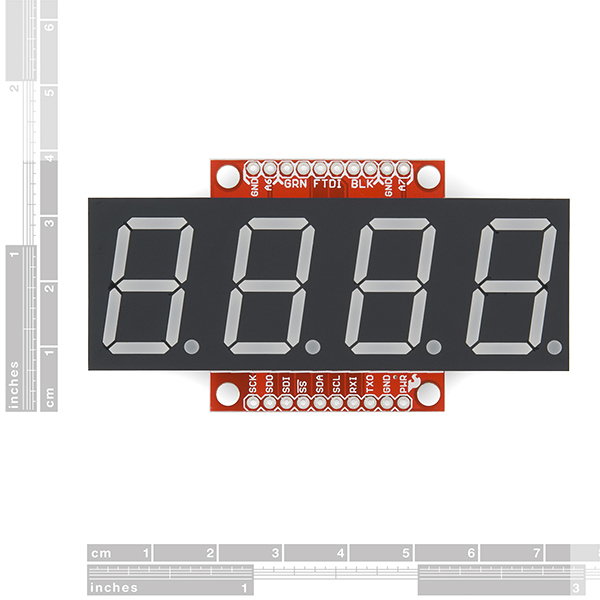 We've found a lot of displays on Mouser/Digikey are listed in metric so we made the switch. Let us know if anything else sticks out. Yes I agree with rsp, should be actual digit height, that's always the way I've known in in the industry and that goes back a long way.